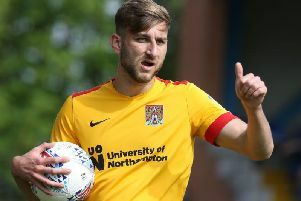 After the stinging criticism they received for their dismal attempts to beat 10 men the previous weekend, Cobblers players didn’t have long to wait for an opportunity to make amends. Beaten 2-1 by Port Vale having led 1-0 with a man advantage after 44 minutes, this time Town were leading 2-1 and again a man to the good 50 minutes into Saturday’s game at Notts County. Once again, however, they failed to make the most of their numerical supremacy as Kane Hemmings’ tap-in was followed by a series of missed opportunities at Meadow Lane, the game eventually ending 2-2. After criticising his side’s ‘shocking’ efforts against 10-man Vale seven days earlier, how did manager Keith Curle feel they got on at County? “We created enough chances,” he said. “I still think there’s more to come but it’s very difficult to go and put on training sessions for playing against 10 men. “But the principles are still the same. We need to move the ball into wide areas rather than just putting crosses into the box when it’s easy for the opposition to make up a man disadvantage. Curle also revealed he gave his players a very simple message ahead of kick-off at Meadow Lane. He added: “I gave them a message on Saturday that won’t change and it’s a message you can take to any changing room at any level - when it’s on to play, play. When it’s not on to play, put the ball into good areas. “As a player, as a team and as a football club, you can take that anywhere. Earn the right to play and go and play when it’s on. Those are good fundamentals that can take you as an individual and as a team a long way.